Another Friday, and today we're at a very special location in Taiwan, Longshan Temple. 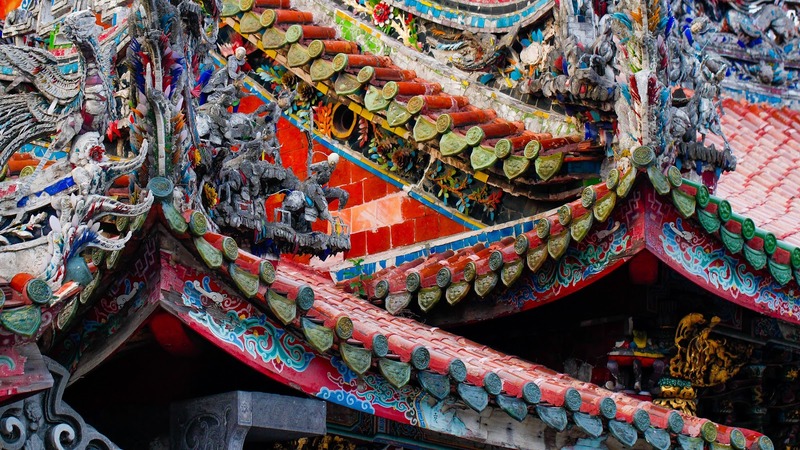 Longshan temple is a Buddhist temple in the Wanhua district of Taipei. It's design is emblematic of classic Chinese architecture, and thousands visit it daily for spiritual needs and also for tourism. Originally built in 1738, the current structure was rebuilt from 1919 to 1924. Unfortunately the originally constructed building from 1738 no longer exists. Yet having been rebuilt and repaired after earthquake, fire and war, the bright colors and eye catching intricate designs on the traditional glazed tubular roof tiles are a feast for the eyes, and provide endless photographic opportunities for the travel photographer who happens by. Admission is free, and hours are from 6:00am to 10:00pm. It's easily accessed from the Longshan Temple MRT subway station.